Hey there friends! Today is a fun day! It's time for the Spellbinders Glimmer Hot Foil System Hop. I bet you have seen some amazing stuff so far. I have a few clean and simple cards using the foil system. I have one project using the Glimmer Plates and one showing how you an use a regular die to create a fun design. I have several easy designs here today. This first one showcases the We Wish You Glimmer Plate. I just love this tree and the green foil makes for an adorable pairing. I die cut the tree with a rectangle Nestabilities dies and then layered it with another rectangle of white cardstock. I added the tree to a striped pattern paper covered card base. 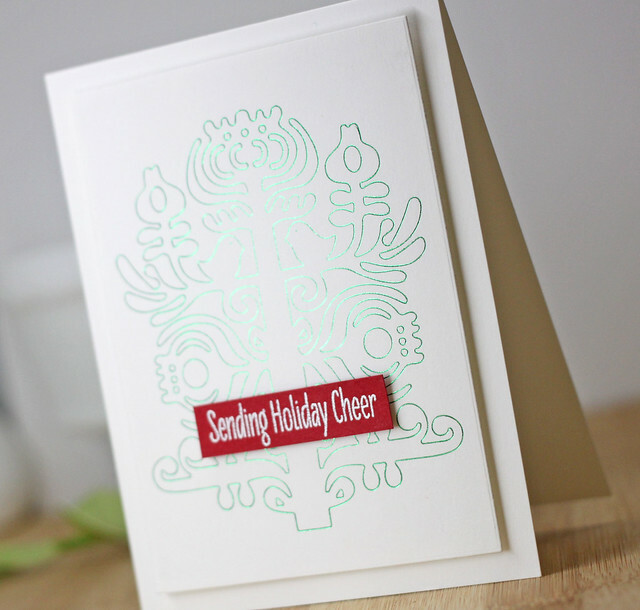 To create this card, I used the Green Glimmer Hot Foil and used the regular die through the Hot Foil System. I love how it looks. 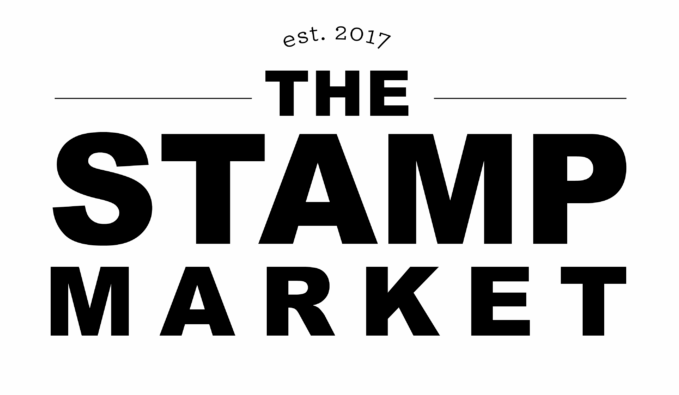 It also gives it a little bit of a letter press look too, which is so detailed and fun! I popped the image up on fun foam on the white card base and then heat embossed sentiment on the front of the card. Check out the Glimmer Hot Foil System by clicking HERE. You can get refills on the Foil by clicking HERE. Check out the Foil Foil Plates by clicking HERE. To celebrate this release, we are giving away a $50 gift certificate to a lucky winner. Please leave a comment on Spellbinders blog by Sunday, November 18th11:59 pm EDT for a chance to win. The winner will be announced in the blog hop post the following Monday. Winner is responsible for shipping cost, duties and taxes. Thanks so much for coming by today. Hope you have a great day! 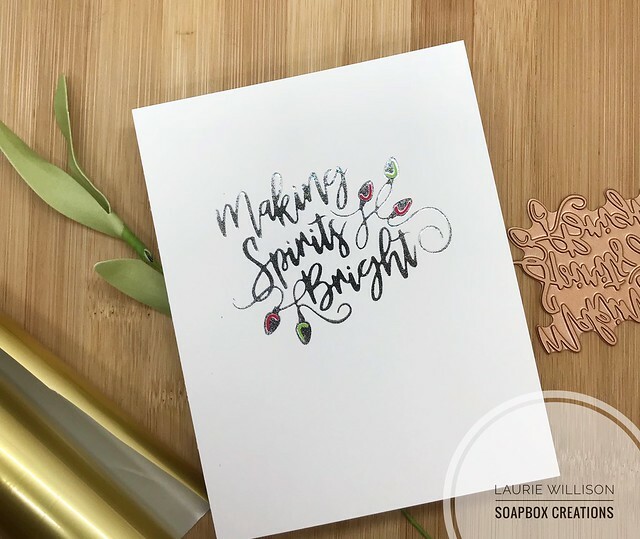 Gorgeous cards and your earrings are to die for, Laurie! How clever you are...they're beautiful!!! the earrings are a clever idea. 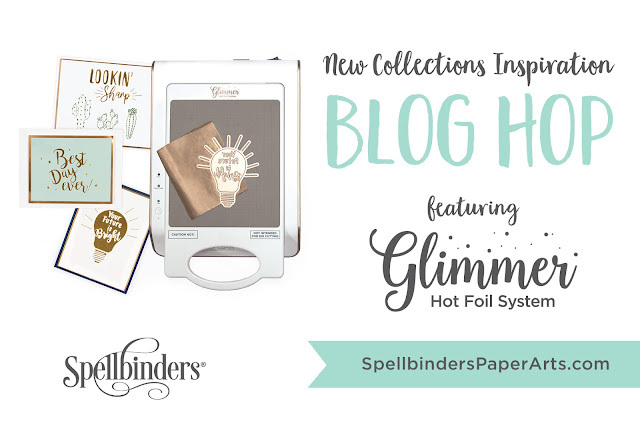 What a fabulous array of ideas for using this new Glimmer Hot Foil System. This tool is going on my Christmas list! You really made the most of your hot foiling system. The earrings are an incredible idea. Thanks for sharing your projects. 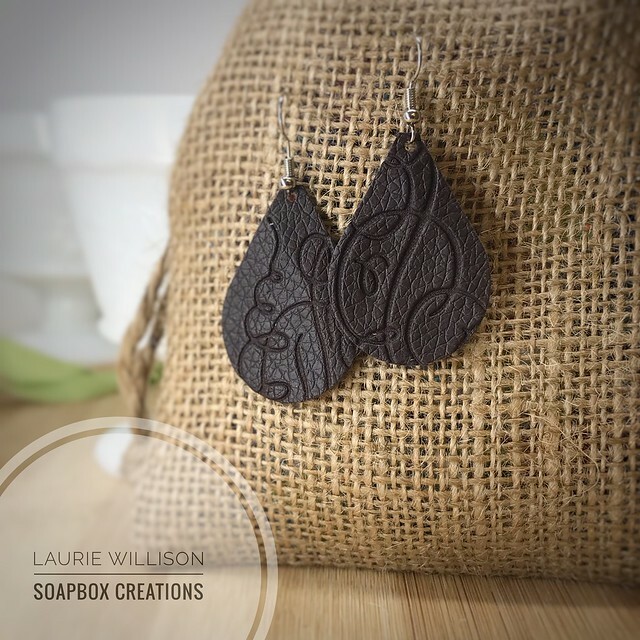 WOW, Laurie, gorgeous cards and LOVE those earrings. Such a great gift idea. WOW! So many amazing things you can do with this! WHAT great creations! Your cards and earrings are beautiful! Fabulous projects Laurie! Your earrings turned out great! It looks like you hit on most of the possibilities available for the machine. I love the earrings!!! Alas, this one purchase I may have to put on the back burner since it's more expensive than my crafting budget will allow. Thanks for the great ideas, though. So pretty! Love the foils! Neat cards. The earrings you made are great. Another awesome way to use the foil machine! Stunning cards and I love that you tried the leather and it worked out so well. Your earrings are pretty. Thanks for the inspiration. Wow even earrings! Love your work. I’m super excited to give this a try! 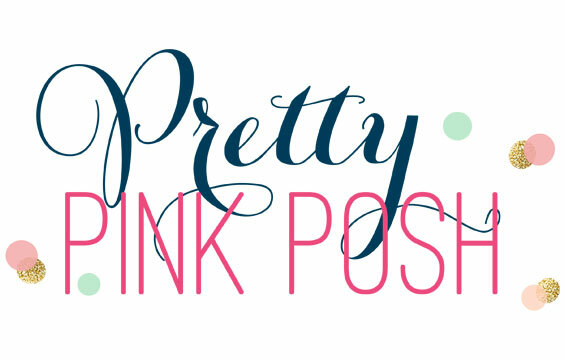 You've shared a fab range of projects today that highlight how versatile these products are. Thanks for sharing your creativity. What a great idea to deboss/emboss leather! Awesome earrings! TFS! Beautiful! Love the leather embossing! Wow - this is gorgeous! Would love to try this! Awh snap! Sweetness. Love the earrings! Thanks for sharing. 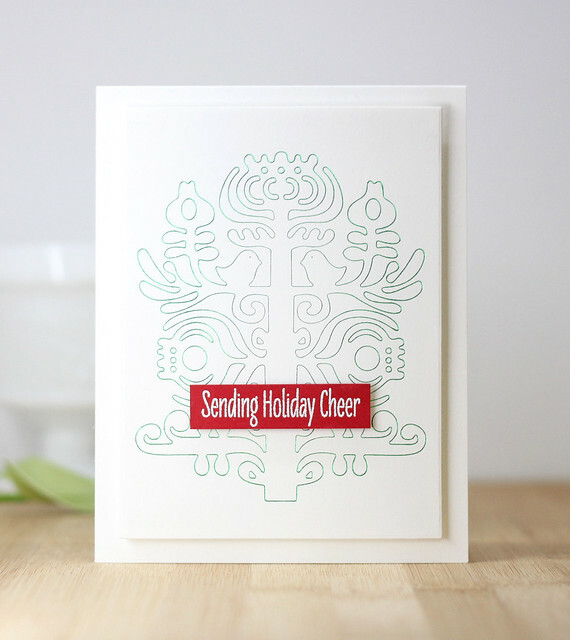 Love your Sending Holiday Cheer Card! Beautiful. I will need the Spellbinders Nordic Tree Die now. Great use of the Spellbinders Glimmer hot foil system. Definite inspiration. Simply elegant! Beautiful cards! Thanks for sharing your creativity! Love each one of your card, Laurie, and the earrings!! So unique and so trendy! Great projects! I looove those earrings! I want to try this technique. I hope I get this machine for Christmas! The earrings!! 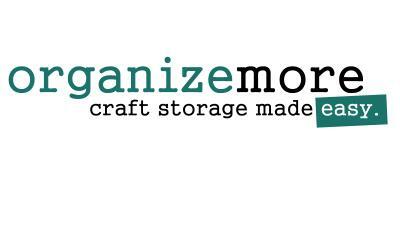 Love the ideas, have to try and see if you can use regular embossing folders! Beautiful cards, and the earrings is such a creative idea! Thanks for sharing. What great creations. Love your earrings and that green foil on the Nordic tree, ooh la la. So very festive. Thanks for sharing all this fun stuff. Love your foiled Christmas tree card. and the earrings are really cute. Okay, now I am officially inspired! And I am totally inspired by the earrings. Very clever. Thank you. Wonderful cards and thanks for sharing how you made the earrings! Thanks for sharing your lovely cards--and leather earrings!!! Awesome! Great cards as always! Thank you for great inspiration. I love how you showed the versatility of this system. They are simply gorgeous. Thanks for the inspiration. What a gorgeous Christmas tree! I like all of them but the Christmas tree is my favorite. Amazing cards, love that Glimmer Hot Foiling! Thanks for the cool ideas of extending the use of this by embossing leather and foiling with dies!! Can't wait to try!! OMG, I love that Christmas tree!!! And those leather earrings...what?!?! How amazing!!! Awesome projects! Gorgeous foiling and clean designs. The earrings - WOW! Oh how I am hoping for the Glimmer foiling machine and your wonderful earrings add to the desire. Fantastic projects! I love foiling on cards and have tried several methods! Can’t wait to give this one a try! And so many plates to choose from! 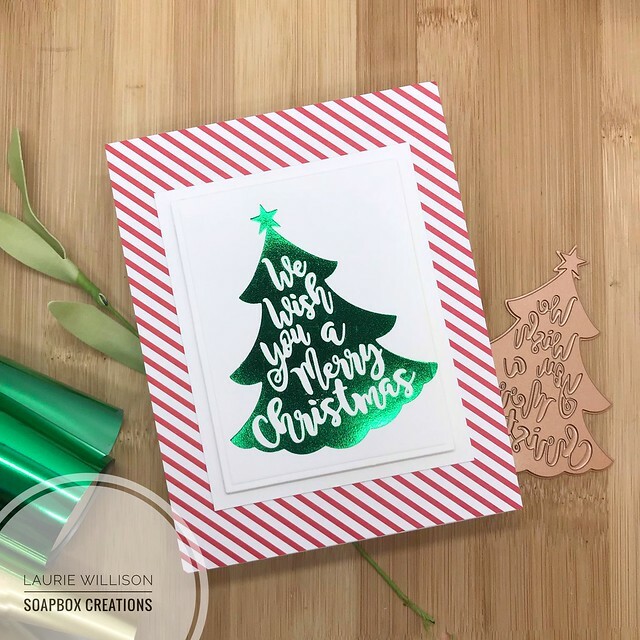 Hey Laurie, am loving this new foil machine and your cards are gorgeous!! But the earrings have me drooling!!! Yes drooling over how awesome they look and can't imagine them on not looking so COOOOOOOOL!!!! Great inspiration! Wow cards and beautiful earrings too! Now even more I am wanting the foil machine! Not only are your cards amazing, but those earrings!! WOW! Thanks so much for sharing! Beautiful projects! Love the addition of the foils! Can't go wrong with some added sparkle! Your projects are fabulous! Especially the cool earrings and the beautiful Nordic tree card. Thanks for showing us more wonderful ways this machine can be used!